There's no doubt that black culture shapes popular culture in the United States, and black Muslims play an important role too, most notably through rap and hip-hop — in fact, a lot of your favourite rappers are actually Muslim. From modest fashion to activism (resistance born out of our need to survive), all the way down to the use of the word “wallahi”, the contributions of black Muslims is evident. Oscar-winning actor Mahershala Ali and Somali-American model Halima Aden have both been on major magazine covers, adorned in the colours of the American flag — an ironic juxtaposition considering the violence enacted on black Muslim bodies. The mainstream constantly borrows from or appropriates the subculture, which can lead to a whitewashing of the contributions people from marginalised groups make. Despite it all, however, black Muslims have continued to find ways to resist and to celebrate both their blackness and their Muslim identity, using hashtags like #BlackOutEid to simultaneously stunt and push back against the erasure of black Muslims by non-Muslims who are black, and non-black Muslims. This is why now, more than ever, it’s important to consider how we engage with the things we consume and how we support what marginalised people are creating. So if you want to back some black Muslim businesses, here are some suggestions that would make perfect gifts at Eid or, quite frankly, at any time of the year. 1. Get your glow on with a bottle of Intense Hydra Cream from Salima Skin Solutions. Salima Skin Solutions is a Canada-based company founded by Salima Asma, a skin care enthusiast with over 15 years of experience in advanced medical aesthetics. Salima has got you covered on everything skin, from serums to face wash and cute travel kits so you can glow well after Eid! Get the Intense Hydra Cream for $37 from the brand's site. 2. Make sure your skin looks flawless for those #EidSelfies with Mud & Musk. Mud & Musk is a skin care company based in Australia. They say they make “DIY skin care” that is easy to use, and they even provide handy tutorials on their site. If your skin needs some extra love, check out the “Customization Guide,” where you can input your skin type and find the products that work best for you. 3. For those of us who love headwraps, or who wear hijab, Amara has got you covered with scarves that are rich in color. Amara is a company based in Arizona. As well as selling accessories, it has a blog where writers discuss important issues. Shop with a purpose. It’s an affordable luxury brand for those who want to wear hijab or a turban, and its colors are rich and “hand selected to complement deeper skin tones.” You can buy one of their scarves here. 4. Buy from Bilan without feeling guilty — because this is an ethical fashion line. Bilan RK is a Somali Danish clothing brand based in Copenhagen. In its first collection it used traditional Somali fabrics to make modern, trendy pieces. “Gareys Top With Flounce” is 169 DKK or, about about $28. It’s flirty and fun, and easy to pair with any bottom. 5. Amira Rahim is a genius with the paintbrush, and she doesn’t only make art to place on your wall. Amira Rahim is an abstract artist based in the UAE. 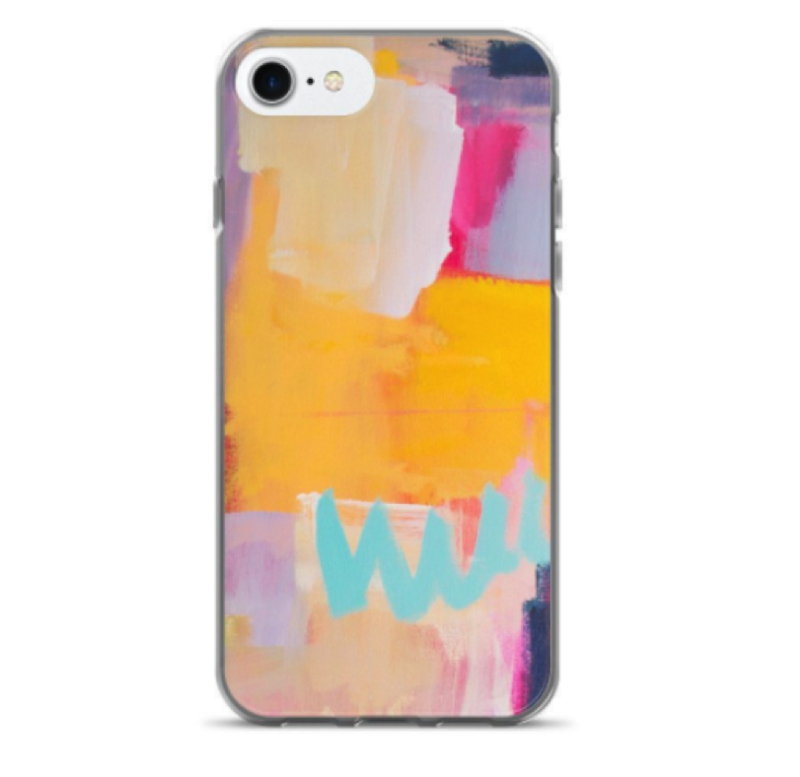 Her work is striking, and those of you who appreciate modern art and energetic hues can get it in the form of these cute trinkets. 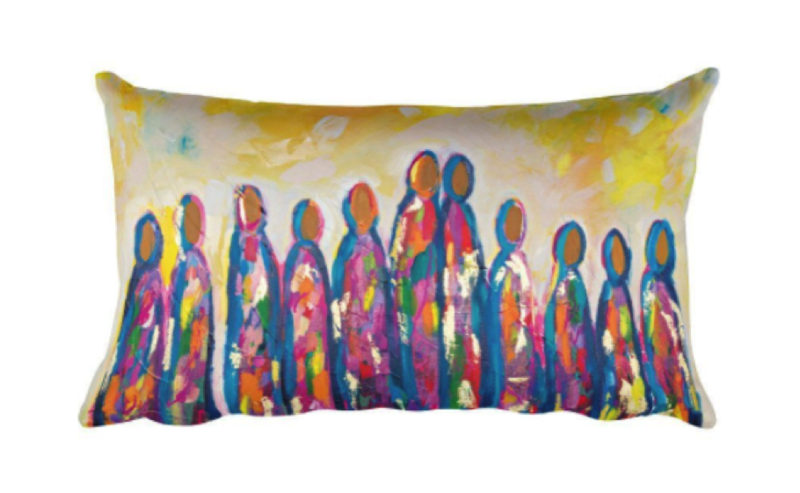 Wear her painting on your iPhone or adorn your living room with pillows that have Rahim’s art on them. You can get the “Pink 1” iPhone case for $35, and this “Love Amongst Us” pillow is a perfect gift at $38. 6. For those of you who want to hydrate your hair and don’t know where to begin, NaturAll Club got you covered with its Hair Mask Solution Box. Muhga Eltigani decided to forego law school and start NaturAll Club to make products that are geared toward people with curly hair. It's the only company that uses fresh avocados in its hair masks, because avocados are nourishing for your hair — they aren’t only good on toast. Get the Hair Mask Solution Box for $69. 7. Each one of these candles is individually hand-poured and comes in a beautiful vessel. Get your momma or someone’s momma a candle. The founder of Haramesque, Azza Gallab, is based in Brooklyn and draws her inspiration from her birthplace, Sudan. Her love for beautifying and aroma-fying spaces led her to start her candle company in her apartment in 2015. Candles are a great gift and you can’t go wrong with Azza’s concoctions. Get the “Go Within Moon Potion” for $55. 8. Glisten with this affordable Aneeqi Naturals scrub that is gentle enough for your face and your body. Aneeqi Naturals is a wellness and skin care company based in New Jersey. Aneeqi carries a wide range of products, from scrubs to bath bars and handmade soaps to essential oils. Get the Rose Clay Facial Body Scrub, $13. 9. This beautiful jewellery line is inspired by the African diaspora. Adorn yourself or gift a queen you know with the Queen Omega Earrings. Zen Elements is a boutique based in Philadelphia, founded in 2014 by Zenda Shareef. Zenda draws inspiration from the diaspora and indigenous cultures, and believes that adorning your body and living space is a means of nurturing the spirit. This boutique carries both clothing and jewelry. Get the Queen Omega Hoop Earrings, $75. 10. Warsan Shire has made a name for herself before even releasing her first full poetry collection. Warsan Shire is a British writer, poet, and editor. She is well known for the work she did with Beyoncé in Lemonade and, in all honesty, she deserves all of your coins. She won a Peabody and her new poetry collection is supposed to come out at any moment. In the meantime, indulge in her brilliant writing. Get a copy of Teaching My Mother How to Give Birth for $7.